Smoked fish on the east coast is a totally different thing than smoked fish in the midwest (sorry, left coast–I don’t know as much about you). I was reminded of this regional difference while in Minnesota last month. At lunch, we checked out another Triple D joint in Duluth with a very confusing name (just see the link). Not as confusing was the fact that we had the best seat in the house–corner high top on the deck overlooking Lake Superior on a gorgeous, sunny day with a strong, refreshing breeze. After a famishing car ride, I ordered a side of smoked salmon to go with my cranberry wild rice French toast (P.S., if ever there was an occasion to order French toast, I nailed it.) and was a little taken aback when what arrived was not the gel-like lox to which I’ve become accustomed. It was a much more dry, firm, flaky smoked fish which conjured up memories of Christmas morning breakfast, when we would eat smoked salmon on Ritz crackers, plus homemade blueberry coffee cake. Note to self: bring back that menu for Christmas brunch this year. Note to Mama Olson: send me the coffee cake recipe. If ever on a cruise ship you see rather befuddled passengers poking and eyeing the lox, you can be confident they’re midwestern. Vice versa, if you happen to work at a bagel shop in Minnesota (do those exist, outside of Bruegger’s?) and encounter an enraged customer wondering what is this pink stuff on their sandwich, you’re not being punk’d. It’s just a die-hard, bagel-crazed New Yorker (and not just because of the yelling). They’re likely to be a million times more understanding and quiet (maybe) after you’ve explained that this is smoked fish in Minnesota, and various other parts of the country. Northern Waters Smokehaus is a well regarded supplier of smoked fish at many Duluth restaurants, as I quickly learned. 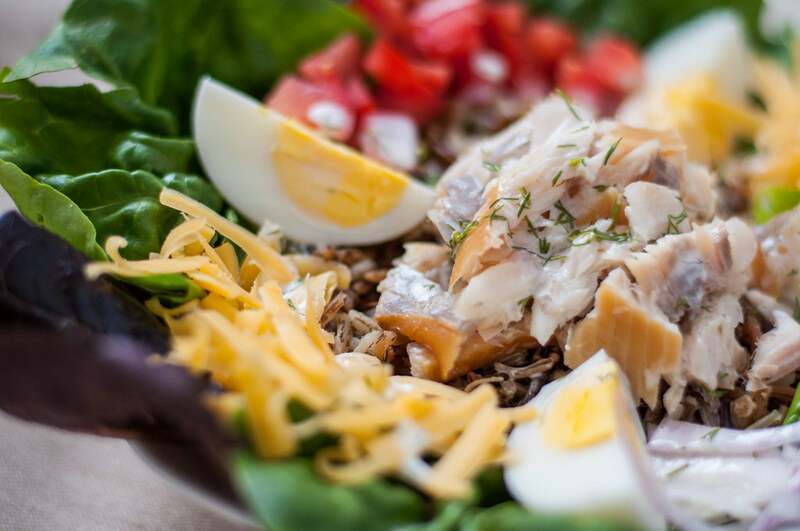 My second encounter, this time with their smoked trout, was at Fitger’s Brewhouse Grille, where I broke my salad-avoiding habits for a big bowl full of greens plus so many of my other favorites–hard boiled egg, red onion, wild rice, CHEESE, and a thick, creamy, smoky dressing. They all did a very good job of hiding the fact that I was eating a salad at all. Honestly, I don’t even know if it belonged in the salad section it was so hearty. 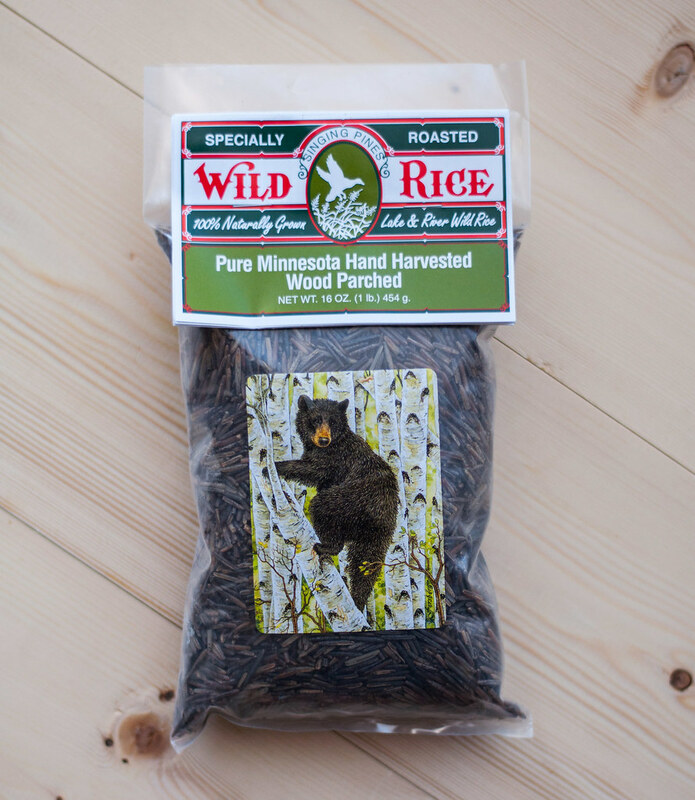 Since prolonging my stay in Duluth until the below zero temperatures hit was out of the question, I made sure to pick up some high quality, local wild rice at one of the cute shops in Canal Park (right on the lakefront!) so I could recreate this textural bonanza at home. The rice is from Singing Pines, and as far as I can tell, they don’t have a website, but there are several places to get it online. Mine was packaged with a super informative brochure detailing pretty much anything you care to know about the grain, plus 15 to 20 recipes. 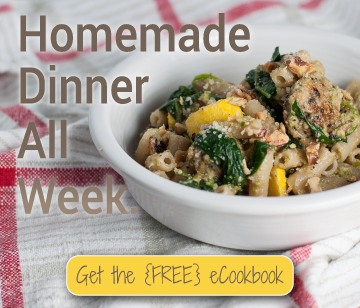 I’m not even sorry for the onslaught of wild rice recipes that may overtake the Natural Comfort Kitchen blog in the coming months. 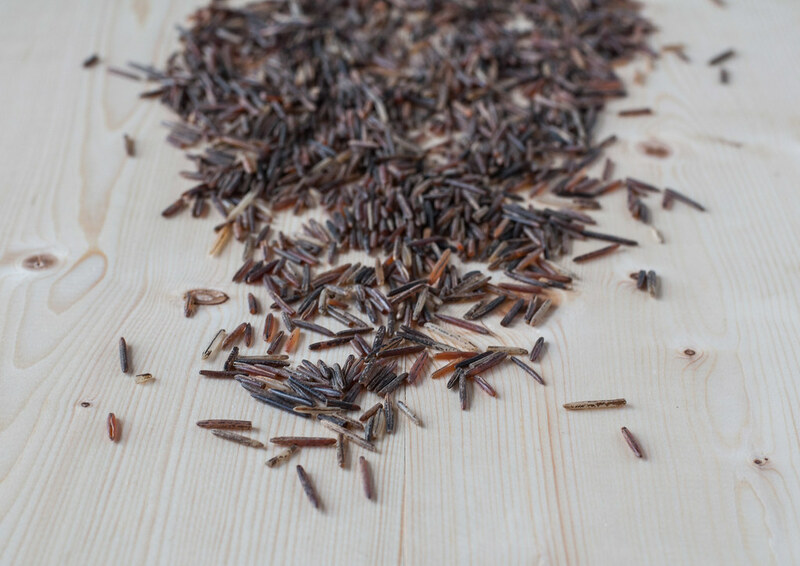 Use any wild rice you can find, but know that the price tag for the good stuff is worth it, if you do decide to order online (it took Steve about 25 minutes of persuading me to pay $14.99 for a pound of rice). As for the fish, I was pleasantly surprised to find smoked trout at both Trader Joe’s and Whole Foods for reasonable price tags. Northern Waters Smokehaus offers online ordering (which I literally discovered 7 seconds prior to typing this) if you plan ahead. I’m sure it’s worth the wait. My biggest adaptation to the original salad to make it my own was to totally revamp the dressing. The smoky, creamy dressing was good, but the flavor of it was a bit heavy for the salty fish, and it was so thick that it was hard to toss to coat the salad. I wanted something thinner, still creamy, and lighter in taste but complementary to the fish. Lemon and dill sounded like a win (there’s a reason they serve lemon wedges with fish, right? ), and indeed it was. 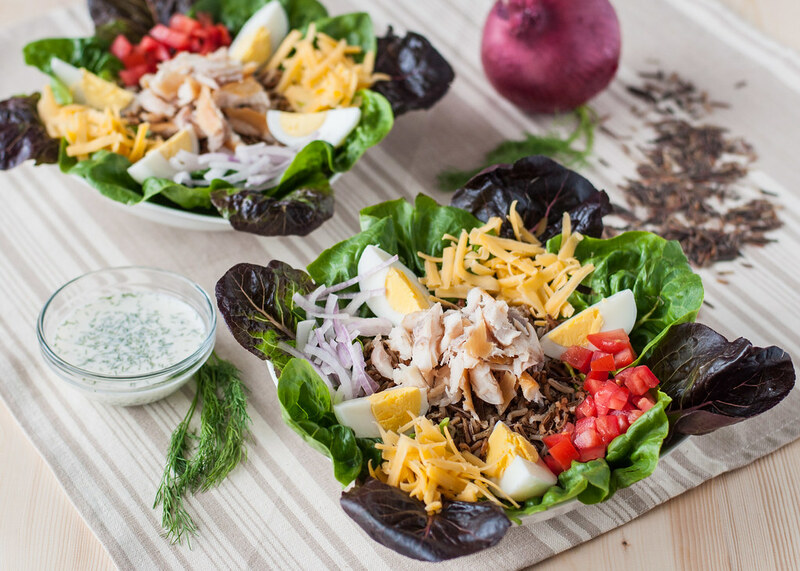 The acid of the lemon and freshness of the dill worked with the salty smoked fish and even the strong flavor of the raw onion, and the consistency is perfect to stir into the salad so you get a little bit on every bite. I shot these photos at 9 am on a Saturday, when I wasn’t exactly dying for a fish salad, but when I mixed up the leftovers for dinner later, it brought me right back to that relaxing late night dinner in Duluth. Mission accomplished. 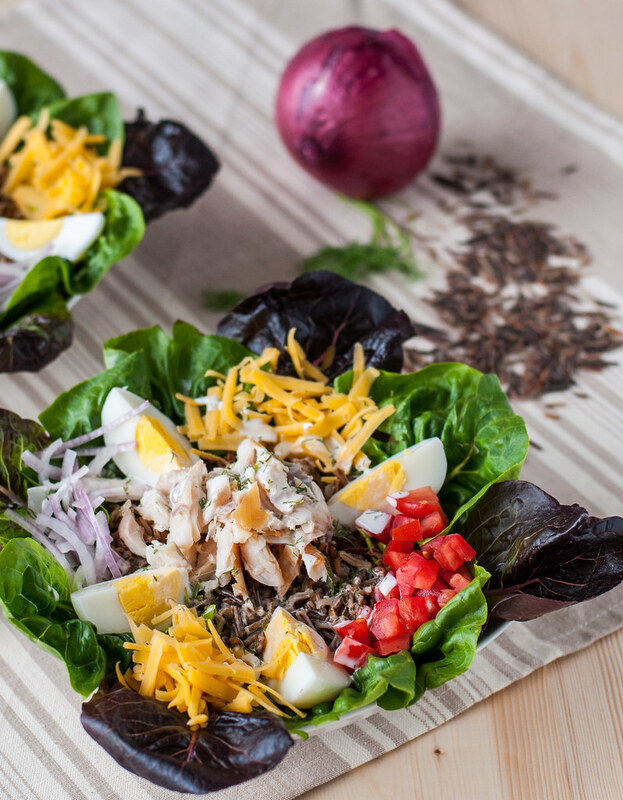 Wild rice and smoked fish inspired by northern Minnesota cuisine make up a hearty main dish salad. 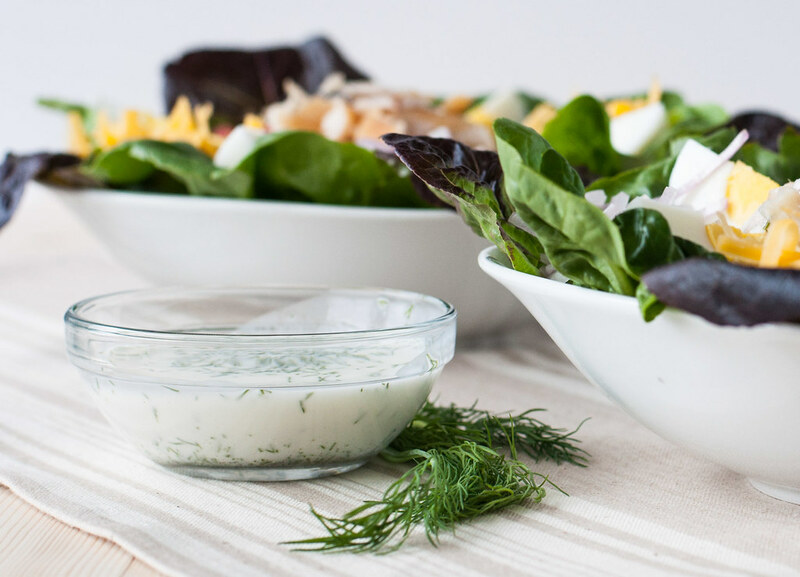 Lemon dill buttermilk dressing perfectly complements the salty smoked fish. Make the dressing by whisking all the ingredients together, then store in the refrigerator until ready to serve. Letting stand in the fridge will blend and boost the flavors. Pull apart the smoked trout into bite sized pieces, and quarter each hard boiled egg. 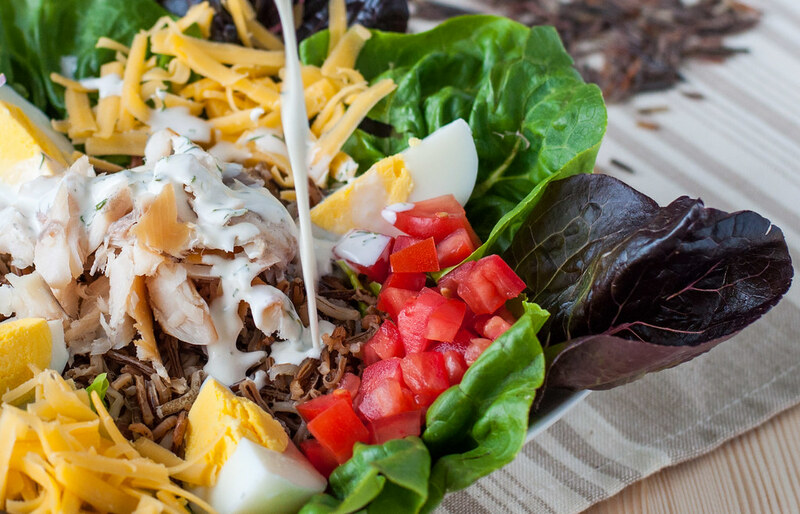 To serve, evenly distribute the lettuce amongst four dinner plates or large salad bowls. Top with one fourth of all other salad ingredients. Serve with dressing poured over or on the side. Best served in individual portions, not family style. You don't have to waste a whole quart of buttermilk to make this dressing. After shaking the carton, I pour mine into ice cube trays (each cube is approximately 2 tablespoons) and freeze, then store the cubes in plastic bags in the freezer until I need them for a baking project, pancakes, or dressing. You’ll need 1 cup (about 6 oz.) of dry rice for 3½ cups cooked. I found the best ratio of rice and water to be 1 C dry rice to 2¾ C water, not 3 C water as recommended on some packages. Rinse the rice in a fine strainer with cold water for 30 seconds before cooking. To cook, bring salted water to a boil (stock or broth would work well and add extra flavor), added the rice, stir, then reduce heat to low and cover. Cook for 15 to 25 minutes at a simmer. My rice was done after 20 minutes. Drain any excess water, then return cooked rice to the pan and cover for 5 minutes, to allow cooking to finish and any extra moisture to absorb into the rice.